Made of REAL Italian terracotta clay. They start with the finest clay product, fire it in a gas kiln to a hard, even toned, compact clay and then import it to us directly from the factory in Italy. From small to extra large we sell all sizes. The 24" OD is the largest saucer you can get made of clay. 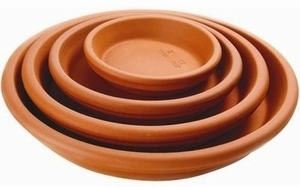 Any pot that requires a larger saucer will be very heavy, so you should switch over to a poly resin saucer. They are durable, can hold the weight and will never crack and come in 32 colors including terracotta color. cm7 $2.20 2.00" 3.00" .50"
cm9 $3.40 2.50" 3.50" .75"
cm11 $3.60 3.50" 4.25" 1.00"
cm13 $4.20 4.00" 5.00" 1.00"
cm15 $4.60 4.75" 6.25" 1.00"
cm19 $6.00 6.00" 7.50" 1.00"
cm21 $6.40 6.75" 8.25" 1.50"
cm23 $9.20 7.50" 9.00" 1.50"
cm27 $10.60 8.75" 10.75" 2.00"
cm31 $17.20 10.00" 10.75" 1.50"
cm36 $22.40 11.50" 14.00" 2.00"
cm41 $32.00 13.00" 16.00" 2.00"
cm46 $48.00 15.00" 18.00" 2.00"
cm51 $80.00 18.00" 21.00" 2.00"
cm62 $160.00 21.50" 24.50" 2.50"